No matter where life takes you, you will always check the market and always want to continue being a part of it. It's like that first true love, it will always be there no matter what the distance, no matter whether they are alive or dead. My goal is to become financially independant. I don't want to rely on the economy/job market to survive but on myself. I hope the FX will make my dream come true. EJ missed the initial move but got some nice pips. 118 pips in total. Out for the day children time! Good trading again dragon, you're the man! I think I see how you are trading, something like fat cat SR or high not breaking higher (or low not breaking lower) but on a 15 min which gives confirmation of a reversal/continuation. 1. are you seeing setups from the 15 min? 2. are you using the 5 min to take trades? 3. If so, are you waiting for the 5 or 15min candle to close or do you enter when you see a bounce? 4. Do you use market, limit or stop orders? 5. Do you use a fixed stop, if so you stick it at the swing point? Hi Dragon can you explain what MM you are use for your trades? Just calculate your max loss an devide it by the amount of pips SL you will use. ok thanks i just thought you use something different now. Would it be possible if you have time to post some trades next week with analysis? Noticed something today that been looking at for quite a while but it finally hit home today. In trying to copy dragons methodology, by entering at held profit, if it is done right there is virtually no heat. 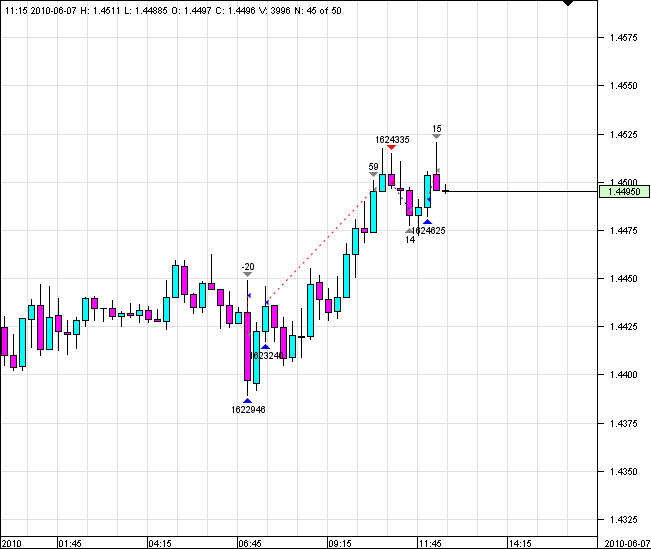 If entered wrong, will know within 5-6 pips. Once again thanks dragon for posting your charts. Last edited by 88888 on Fri Jun 11, 2010 10:56 pm, edited 1 time in total. BTW, I use dukascopy for trading and MT4 for charting. Last edited by 88888 on Fri Jun 11, 2010 10:54 pm, edited 1 time in total. Both trades above are GBPJPY.